FAYETTEVILLE — After nearly eight months of searching, Arkansas finally has its new football coach. Multiple reports Tuesday stated Bret Bielema has accepted the Razorbacks' coaching position, ending a 7-year run as head coach at Wisconsin. He is expected to be formally introduced at a Wednesday press conference in Fayetteville. 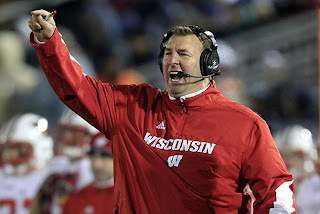 Bielema went 68-24 as coach of the Badgers. Under his tutelage, Wisconsin has won three consecutive Big Ten championships, including a 70-31 win over Nebraska in the league's title game last Saturday. His teams recorded at least 10 wins four times and will appear in their third consecutive Rose Bowl next month. ESPN reports Bielema hopes to coach the Badgers (8-5) in their bowl game against Stanford. In 2006, Wisconsin beat Arkansas 17-14 in the Capital One Bowl in Orlando, Fla. The Badgers finished 12-1 that year, their best record under Bielema. Bielema, 42, played college football at Iowa and began his assistant coaching career there in 1994. He spent eight seasons with the Hawkeyes before moving to Kansas State as a co-defensive coordinator in 2002. He was hired as Wisconsin's defensive coordinator in 2004 and promoted to head coach following Barry Alvarez' promotion to athletics director in 2006. Bielema's Wisconsin contract paid him more than $2.6 million per year - the 18th-highest total among college football head coaches, according to USA Today - and ran through 2016. Terms, including salary and duration, of Bielema's Arkansas contract weren't immediately available. Bobby Petrino, the former Arkansas coach who was fired in April for misconduct, made $3.56 million annually as part of a seven-year contract signed in 2010. Forbes rated the Razorbacks as the eighth-most profitable college football program last year at a value of more than $89 million. Bielema succeeds John L. Smith at the helm of Arkansas' program. Smith signed a short-term contract in April and was reassigned to an administrative position last weekend. The Razorbacks, which combined for 21 wins in the two years prior, finished the 2012 season with a 4-8 record.